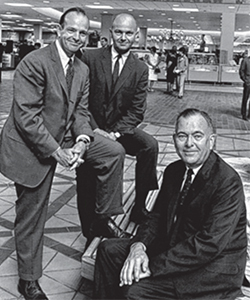 Donald Dayton (seated) with brothers Kenneth and Douglas, late 1950s. 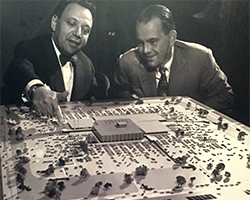 Donald Dayton with Southdale architect Victor Gruen, 1952. Reference: Minutes of The Board of Directors and other documents of the Friends of the Wild Flower Garden, Inc.; History of Dayton Company; Minneapolis Tribune. Text by Gary Bebeau.